It is a test of how hot a sugar syrup is, and of how much water is left in it. At this point of heating, the sugar concentration in the syrup is 95%. You test by drizzling a small amount of the sugar syrup from a spoon into a cup of cold water. If the stage has been reached, the syrup will form pliable threads that will bend a bit before cracking. 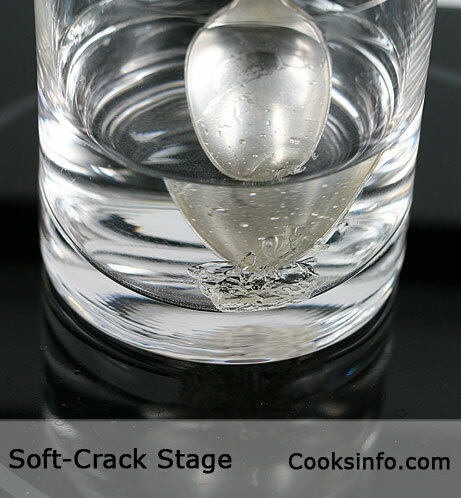 You may actually hear cracking and be alarmed that it’s the glass cracking, but it is the sugar. The simmering sugar syrup will have its bubbles becoming denser. The Soft-Crack Stage is called for in recipes for butterscotch, saltwater taffy, etc. High altitude: For every 300 metres (1,000 feet) that you are above sea level, subtract 1 degree C (2 degrees F) from the temperatures given in your candy recipe.